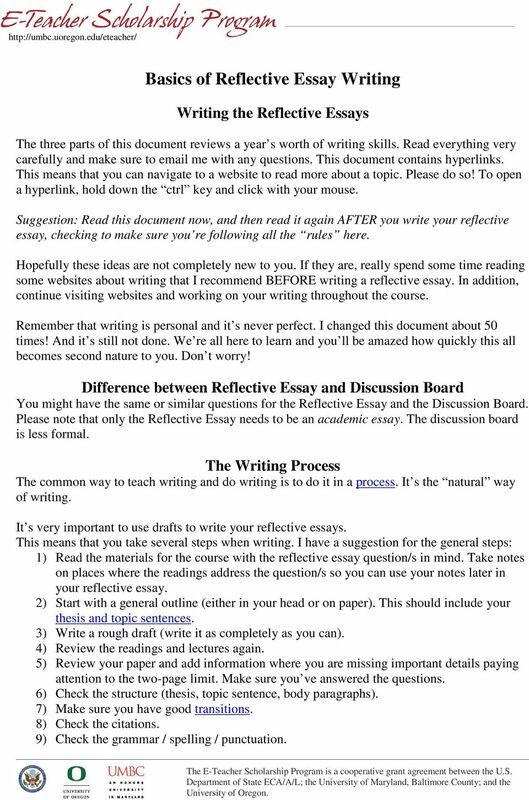 Download "Basics of Reflective Essay Writing"
1 Basics of Reflective Essay Writing Writing the Reflective Essays The three parts of this document reviews a year s worth of writing skills. Read everything very carefully and make sure to me with any questions. This document contains hyperlinks. This means that you can navigate to a website to read more about a topic. Please do so! To open a hyperlink, hold down the ctrl key and click with your mouse. Suggestion: Read this document now, and then read it again AFTER you write your reflective essay, checking to make sure you re following all the rules here. Hopefully these ideas are not completely new to you. If they are, really spend some time reading some websites about writing that I recommend BEFORE writing a reflective essay. In addition, continue visiting websites and working on your writing throughout the course. Remember that writing is personal and it s never perfect. I changed this document about 50 times! And it s still not done. We re all here to learn and you ll be amazed how quickly this all becomes second nature to you. Don t worry! Difference between Reflective Essay and Discussion Board You might have the same or similar questions for the Reflective Essay and the Discussion Board. 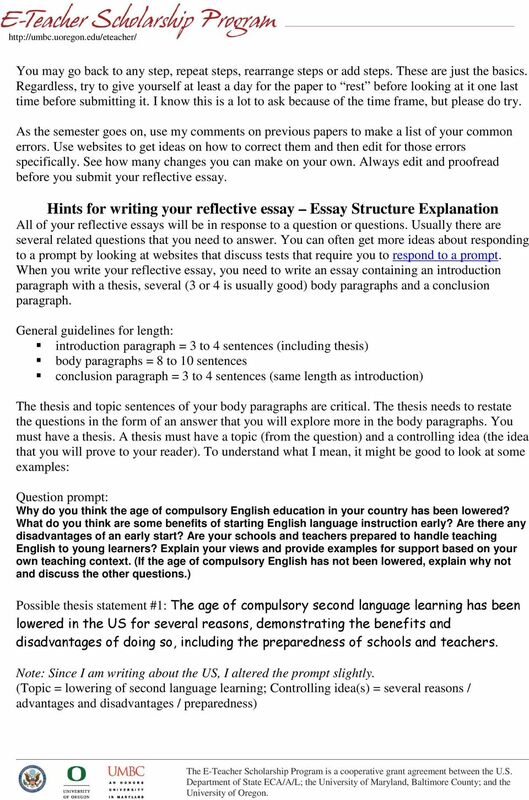 Please note that only the Reflective Essay needs to be an academic essay. The discussion board is less formal. The Writing Process The common way to teach writing and do writing is to do it in a process. It s the natural way of writing. It s very important to use drafts to write your reflective essays. This means that you take several steps when writing. I have a suggestion for the general steps: 1) Read the materials for the course with the reflective essay question/s in mind. Take notes on places where the readings address the question/s so you can use your notes later in your reflective essay. 2) Start with a general outline (either in your head or on paper). This should include your thesis and topic sentences. 3) Write a rough draft (write it as completely as you can). 4) Review the readings and lectures again. 5) Review your paper and add information where you are missing important details paying attention to the two-page limit. Make sure you ve answered the questions. 6) Check the structure (thesis, topic sentence, body paragraphs). 7) Make sure you have good transitions. 8) Check the citations. 9) Check the grammar / spelling / punctuation. 3 BP TS #1: First, the reasons for lowering the age of second language learning in the US are numerous. BP TS #2: Lowering the age of second language learning has many benefits. BP TS #3: Despite these advantages, there are some disadvantages to consider. BP TS #4: The main area of concern with lowering the age of second language learning is in the preparedness of schools and teachers. Notice how the topic sentences repeat the important words (topic / controlling idea) from the thesis. This helps connect your paragraphs. I know what you re thinking: This will make me sound like an obvious idiot. This is too direct! Too structured! Don t think that way. First of all, the ideas we are exploring are complicated. Anything you can do to simplify them is going to help your reader. Making very clear, very direct thesis statements and topic sentences is the easiest way to do this. Remember your goal is to show complex ideas in a simple way. You need to help your reader as much as possible. Don t worry about sounding dumb. You re not going to. When writing your thesis, make sure you don t announce what you will do in the essay. 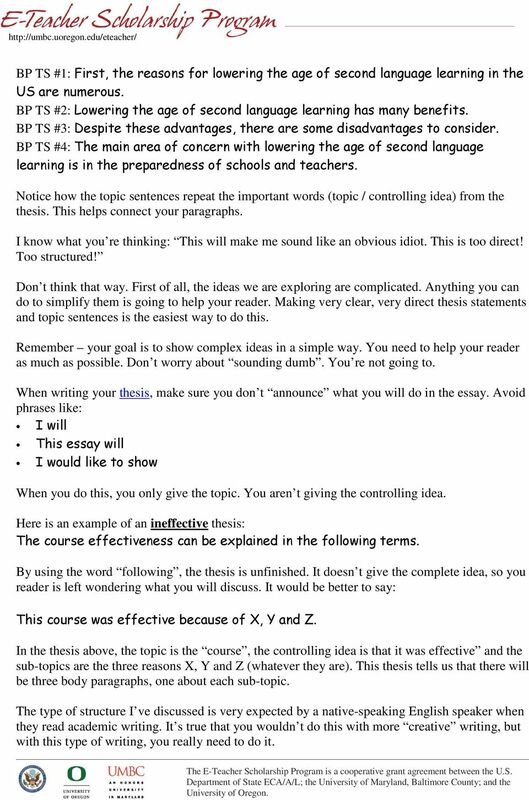 Avoid phrases like: I will This essay will I would like to show When you do this, you only give the topic. You aren t giving the controlling idea. Here is an example of an ineffective thesis: The course effectiveness can be explained in the following terms. By using the word following, the thesis is unfinished. It doesn t give the complete idea, so you reader is left wondering what you will discuss. It would be better to say: This course was effective because of X, Y and Z. In the thesis above, the topic is the course, the controlling idea is that it was effective and the sub-topics are the three reasons X, Y and Z (whatever they are). This thesis tells us that there will be three body paragraphs, one about each sub-topic. The type of structure I ve discussed is very expected by a native-speaking English speaker when they read academic writing. It s true that you wouldn t do this with more creative writing, but with this type of writing, you really need to do it. 4 So try it. It s a particular style that is used in academic writing. That s what we re doing, so work on that structure. Here are a couple more examples: Question prompt: Explain the approach(es) that you should take in your classroom based on what you read about the characteristics of young learners based on the video, lecture, and readings. What kinds of activities and materials do you think are the best for young learners of English? What type of classroom environment do you think is ideal for YLs? Is it possible to build an English-speaking environment in your class from the first day? Explain. Use examples from your context to support your point of view. 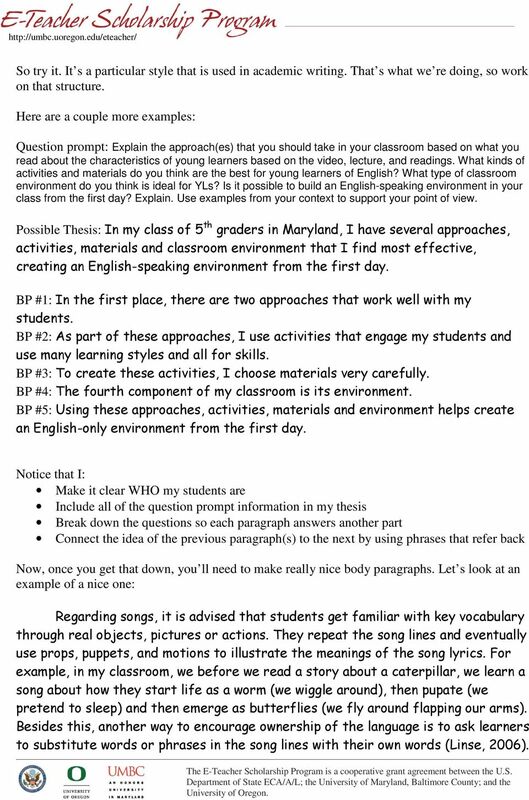 Possible Thesis: In my class of 5 th graders in Maryland, I have several approaches, activities, materials and classroom environment that I find most effective, creating an English-speaking environment from the first day. BP #1: In the first place, there are two approaches that work well with my students. BP #2: As part of these approaches, I use activities that engage my students and use many learning styles and all for skills. BP #3: To create these activities, I choose materials very carefully. BP #4: The fourth component of my classroom is its environment. BP #5: Using these approaches, activities, materials and environment helps create an English-only environment from the first day. Notice that I: Make it clear WHO my students are Include all of the question prompt information in my thesis Break down the questions so each paragraph answers another part Connect the idea of the previous paragraph(s) to the next by using phrases that refer back Now, once you get that down, you ll need to make really nice body paragraphs. Let s look at an example of a nice one: Regarding songs, it is advised that students get familiar with key vocabulary through real objects, pictures or actions. They repeat the song lines and eventually use props, puppets, and motions to illustrate the meanings of the song lyrics. For example, in my classroom, we before we read a story about a caterpillar, we learn a song about how they start life as a worm (we wiggle around), then pupate (we pretend to sleep) and then emerge as butterflies (we fly around flapping our arms). Besides this, another way to encourage ownership of the language is to ask learners to substitute words or phrases in the song lines with their own words (Linse, 2006). 5 This technique helps learners acquire the language by moving from mere repetition to freer practices. Eventually, learners could be asked to write their own lyrics to the tune of the song. In addition, in order to maximize oral production, song lyrics could be exploited the same way as a written text. Actually, Davanellos (1999) points out that anything you do with a text, you can do with a song (p. 13). In this regard, Davanellos (1999) suggests exploiting three stages, including pre, while and post- phases. The ultimate goal of making students go through those three stages is to make them acquire and use the language. As a pre-activity to a song about food, for example, teachers could ask pupils to name any foods they know. Then, teachers could tell them to the names of the foods mentioned in the song. Finally, as a post-stage task, the learners could be asked to have a pair dialogue about the kind of foods they like. In short, teachers would gain efficiency by using songs; however, there are also other tools that are worth considering. Now isn t that a fantastic body paragraph? There are specific examples from the writer and quotes and paraphrases from the readings. It s really nicely developed and carries the reader along from one example to the other. Note also that a body paragraph should have about 8 to 10 sentences. Having that number doesn t guarantee that you have made a good paragraph, but it is a helpful guideline. One last comment: even if you find abbreviations in the prompt, you have to spell them out the first time you use them for the reader to understand. 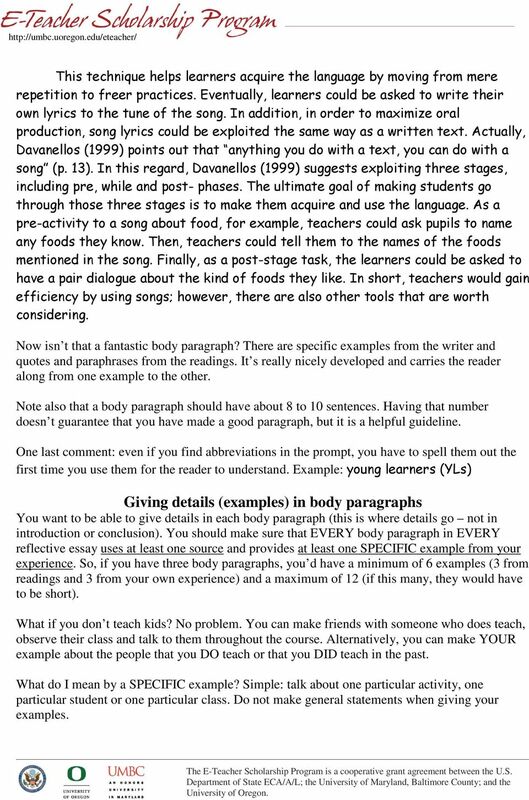 Example: young learners (YLs) Giving details (examples) in body paragraphs You want to be able to give details in each body paragraph (this is where details go not in introduction or conclusion). You should make sure that EVERY body paragraph in EVERY reflective essay uses at least one source and provides at least one SPECIFIC example from your experience. So, if you have three body paragraphs, you d have a minimum of 6 examples (3 from readings and 3 from your own experience) and a maximum of 12 (if this many, they would have to be short). What if you don t teach kids? No problem. You can make friends with someone who does teach, observe their class and talk to them throughout the course. Alternatively, you can make YOUR example about the people that you DO teach or that you DID teach in the past. What do I mean by a SPECIFIC example? Simple: talk about one particular activity, one particular student or one particular class. Do not make general statements when giving your examples. 6 Here is a paragraph that DOES NOT have specific details (this is an undeveloped paragraph that would not be good to submit): A key method that has been highlighted during the course has been the use of thematic plan as a tool to present language in a meaningful and contextualized way. In this regard, teachers are expected to give real-life instructions, integrated the 4 skills communicatively, promote learner autonomy, use experiential and project-based learning (Lobo, 2003). Primary school teachers in Madagascar have already been given a list of themes to be used with their young learners. What needs to be done is to design integrated lesson plans that are based on these themes. Looking at the above paragraph, you ll see that it is a good start. It has a nice topic sentence (with topic and controlling idea), the paraphrase and citation are correct and it develops the topic sentence. But the last 2 sentences are general. There are no specific details. Don t you want to know WHAT themes the teachers have been given? I do! And don t you want to know HOW they are going to design the integrated lesson plans? Wouldn t you like an example? I would! Adding that would make this a complete paragraph. Here is another example of a poorly developed paragraph: It was really special to learn the use of drama in the classroom. This is one of the activities I implemented with a group. It was a good beginning for me. The groups did a good job. I was surprised by their effort and excellent development. I really did not expect what they did. It was amazing to see them acting and having the chance to take other roles. They had the chance to be someone else. 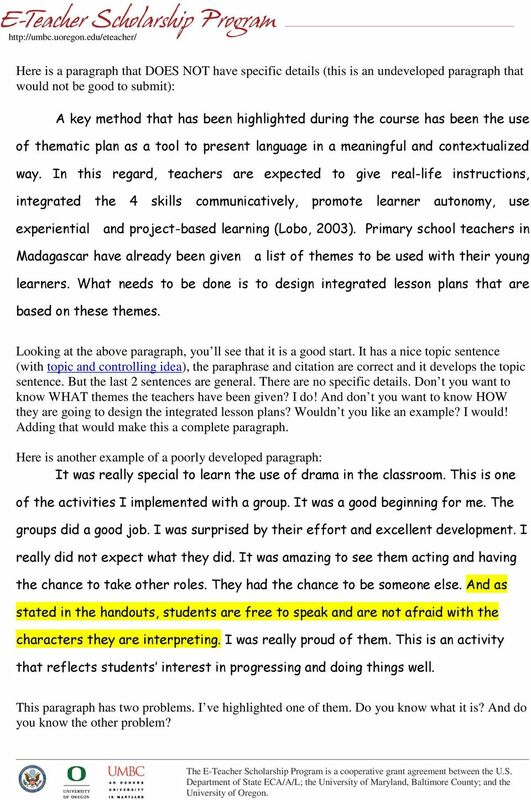 And as stated in the handouts, students are free to speak and are not afraid with the characters they are interpreting. I was really proud of them. This is an activity that reflects students interest in progressing and doing things well. This paragraph has two problems. I ve highlighted one of them. Do you know what it is? And do you know the other problem? 7 The highlighted problem is plagiarism, right? What source does it come from? We don t know. It needs a citation. (Part 2 of this document discusses more about citing.) The second problem is that there is no specific detail. What drama did the children do? What surprised this teacher? What roles did they take? What topic was so interesting for them? Because the teacher does not give us examples, we are left wondering. Details would satisfy us! Finally, notice the content of the sentences in the beginning of the paragraph. They basically say the same thing. They repeat information instead of building an idea. Be wary of that! Conclusion Paragraph Conclusion paragraphs should be the same length as your introduction paragraph about 4 sentences or so. It should summarize your main points, restating your thesis. You want to start with a conclusion transition so that it s clear you are starting the conclusion. Something like: therefore all in all In short in a word on the whole In conclusion what we have, then in sum To summarize in summary in brief finally to conclude Formatting Correctly As long as we re talking about EVERYTHING, let s talk about formatting your document. Type the document in Microsoft Word (please, do not type your essay in the Comments section of the submission). This means that you must open your own document, type it, format it, save it and then Attach it to the Comments section of the submission. Do not type or copy and paste your essay into the Comments section. If you have any questions, you can consult the document on Blackboard entitled How to submit Reflective Essays Margins: 1 on top, bottom, right and left. You can set the margins under File and Page Setup. Type your name, the assignment number, the course name and section and the due date of the assignment in the upper left hand corner of the first page only. Do not indent. 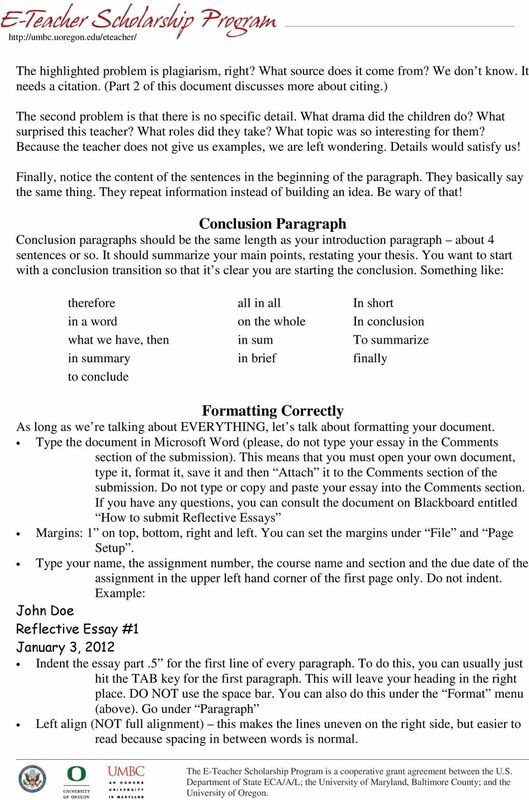 Example: John Doe Reflective Essay #1 January 3, 2012 Indent the essay part.5 for the first line of every paragraph. To do this, you can usually just hit the TAB key for the first paragraph. This will leave your heading in the right place. DO NOT use the space bar. You can also do this under the Format menu (above). Go under Paragraph Left align (NOT full alignment) this makes the lines uneven on the right side, but easier to read because spacing in between words is normal. 8 Times New Roman font, size 12, black color. That s what this is. Never use bold or italic letters. 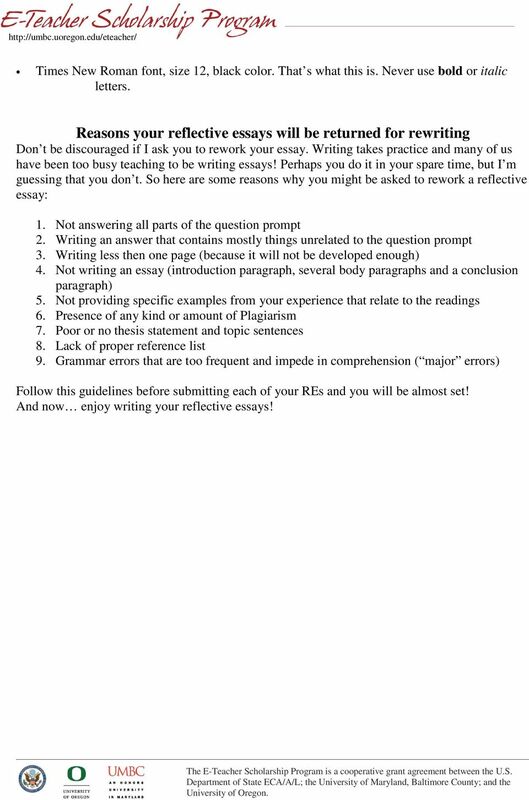 Reasons your reflective essays will be returned for rewriting Don t be discouraged if I ask you to rework your essay. Writing takes practice and many of us have been too busy teaching to be writing essays! Perhaps you do it in your spare time, but I m guessing that you don t. So here are some reasons why you might be asked to rework a reflective essay: 1. Not answering all parts of the question prompt 2. Writing an answer that contains mostly things unrelated to the question prompt 3. Writing less then one page (because it will not be developed enough) 4. Not writing an essay (introduction paragraph, several body paragraphs and a conclusion paragraph) 5. Not providing specific examples from your experience that relate to the readings 6. Presence of any kind or amount of Plagiarism 7. Poor or no thesis statement and topic sentences 8. Lack of proper reference list 9. Grammar errors that are too frequent and impede in comprehension ( major errors) Follow this guidelines before submitting each of your REs and you will be almost set! And now enjoy writing your reflective essays! Writing the MLA Research Paper Philosophy 1. Name Research = re-search, i.e., search and search again for information 2. Purpose a. To inform b. To persuade c. To persuade and to inform 3. Benefits a.
Questia Writing Center 9 Step Writing Guide F A research paper is your opinion on a topic, informed by research you have done. It is not a summary of others thoughts, a personal essay or a review or critique. MDI-01 EXAM PREPARATION & ADVICE DIPLOMA 1. EXAM STRUCTURE AND MARKING SCHEME The MDI-01 exam is 3 hours in duration and has a total of 200 marks available and carry a pass mark of 55% (110 marks to pass). Microsoft Word 2010 Lesson 2 Open the Lab Report Word file that you saved in Lesson 1. We will begin by adding a title page to the report. Position the cursor before the first character in the document.